Produced by Impulse! A&R director Bob Thiele in 1963, this recording is a major showcase of the talented Charles Mingus as a bassist, pianist and writer. In his 1963 original liner notes, critic-at-large Nat Hentoff said that of all the musicians, it is impossible to remain indifferent to Mingus. This recording more than any other testifies to Hentoff's claim. 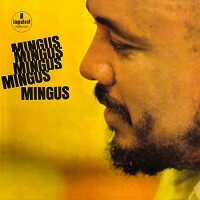 More so today than in 60's, there is truly only one Mingus, Mingus, Mingus, Mingus, Mingus. A big band with interesting colors and reminds me of Ellington style. I don't know too much of Charlie Mingus music but he was great at writing large scores and leading a band. The new AP SACD's are all very good to great sounding. The Miles Davis are the best of the set that I have heard yet. Holy bam!! Mingus to the Xtreme!! First, it was like a rush of cherry flavor. Sweet, smooth, and well, very Mingus. Mingus, Mingus, Mingus, Mingus, Mingus, Mingus was a well crafted display of well timed Mingus. If you know Mingus like I know Mingus... You'll love this dope flashback of Mingus in his prime... So much Mingus!! A large man shower of Mingus!!! Ohhhhh myyy!!! MIIINNNNGUUUSSSSS! !